I’ve written much about the bed that faces east and south beneath the den windows and the large bed that lies opposite it and runs the length of the patio. But my “vision” is to wrap gardens around the back of the house; to update the old railroad-tie, raised bed; and to build a bed along the south fence. Ambitious, I know. Rome was not built in a day and neither is this garden. I imagine all gardeners are familiar with the three year adage: “First year sleeping, second year creeping, third year leaping.” 2014 was year three and I am pleased with much of the leaping that occurred. Take a look. Just getting started in year one. A blank slate is fun. My “vision” is to wrap gardens around the house. 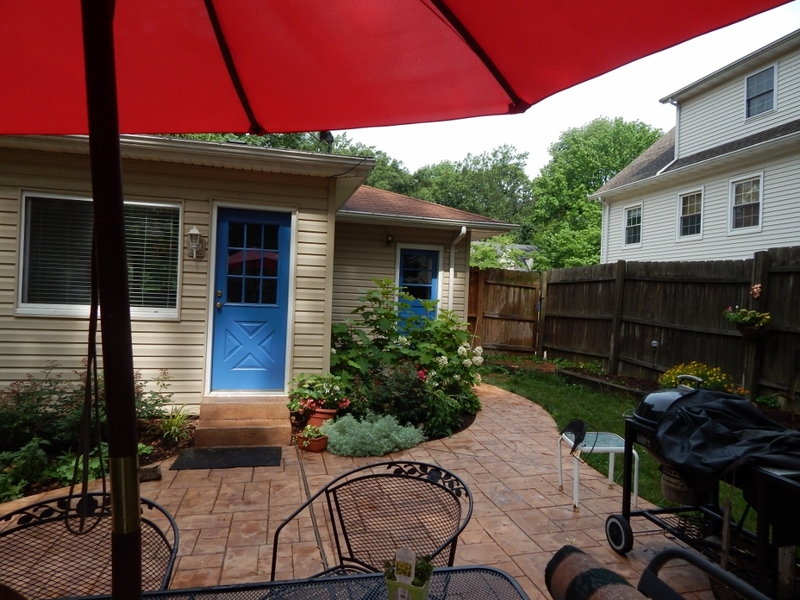 The blue door is the entry to the den, which faces east. 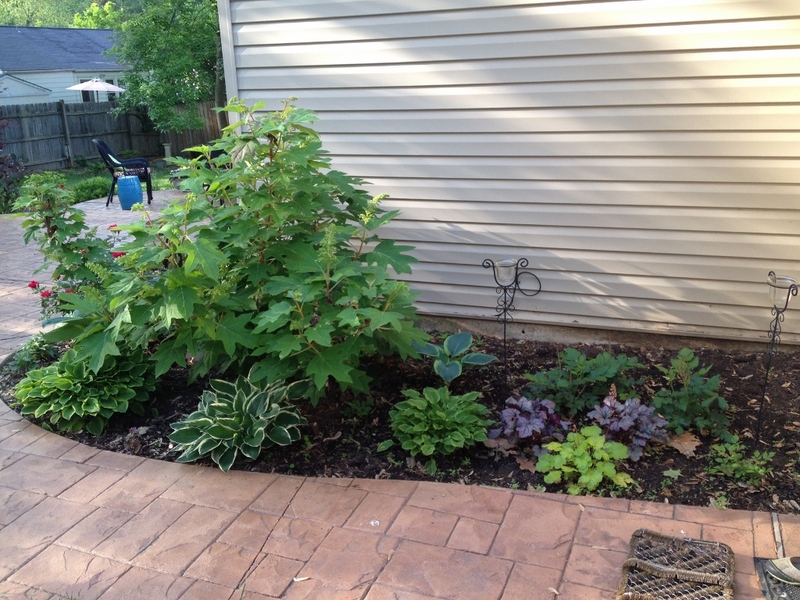 On the north side of the den, I planted a lovely oakleaf hydrangea (“Alice”), one Knockout rose bush and perennials in 2012. My thought was that the oakleaf would be a screen and behind it would be my potting shelves and storage for the trash cans. Because I am the youngest of two sisters who have great sensibilities, I listened when they observed that seeing the trash cans first thing upon entering the gate gives a less than stellar first impression of the garden. 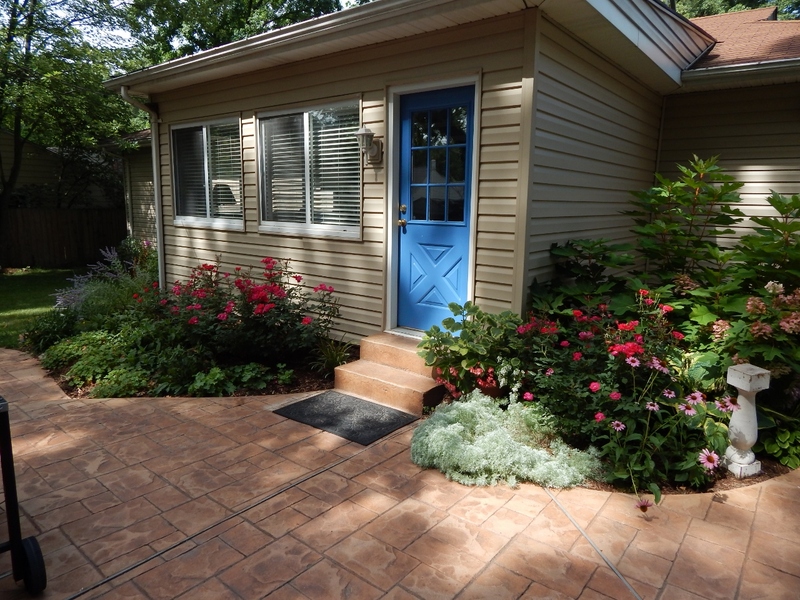 My thought in planting the oakleaf hydrangea (in the back of photo) was to create a screen to hide the potting shelves and trash cans. The view from the gate…not a welcome one, according to my older and wiser sisters. 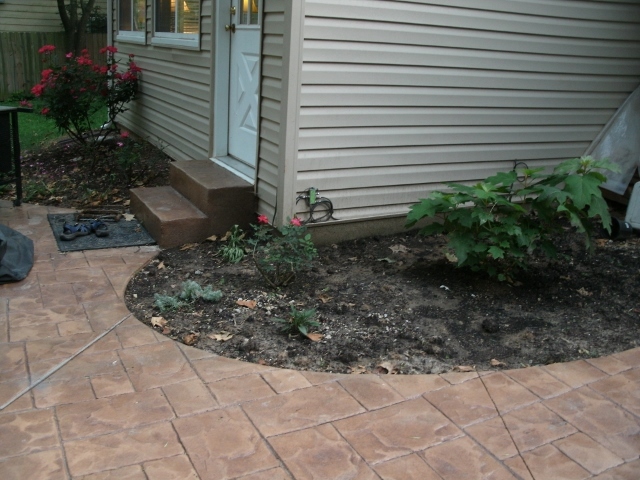 A clean up of the area commenced in 2014, and plantings were installed. 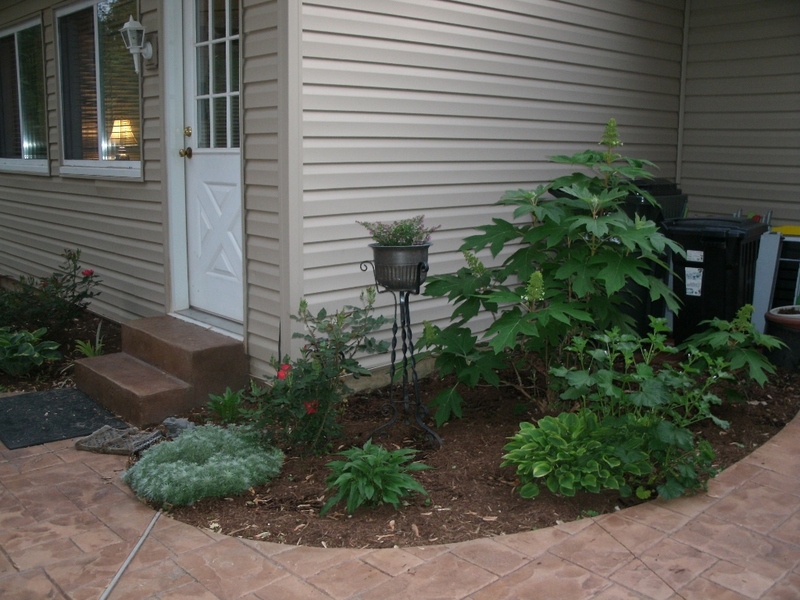 The “after” look includes plantings of hosta, heuchera, astilbe and ferns. The oakleaf has turned into a godzilla of sorts, devouring the hostas with its branches. I will move all the hosts in the spring. So two seasons later, I heeded their advice and extended the bed and moved the trash cans and shelves. My gardening style tends to be experimental in that I will place several specimens in a bed to see how they behave. The back end of the bed is shaded. In fact, the oakleaf pretty well grabs the last of the sun as the bed turns north facing. I expect to move many of these shade lovers to a new bed I am building on the south side of the yard (more on that in another post). 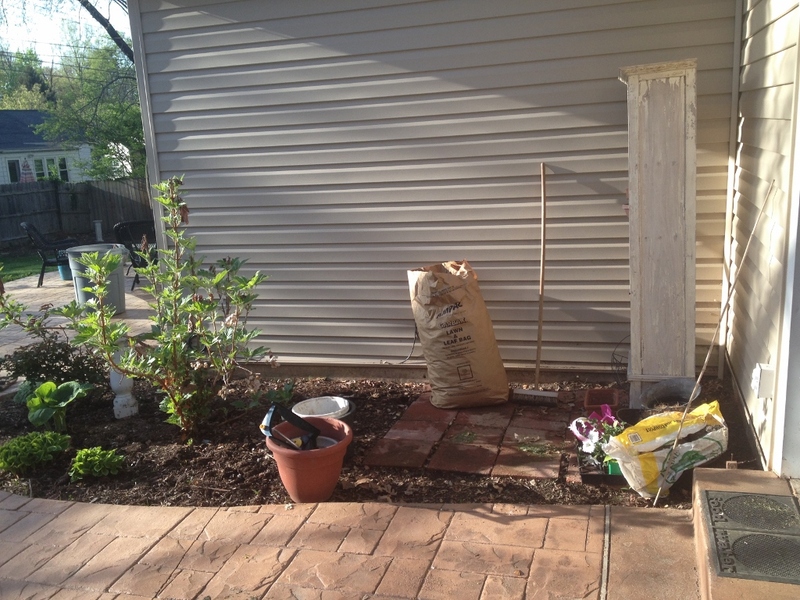 In fact, I am contemplating removing the smaller-sized plants and moving an azalea in here. I think the balance will be better. I look forward to sharing with you my plans for some new garden spaces in 2015 and hearing your comments. Thanks for reading. 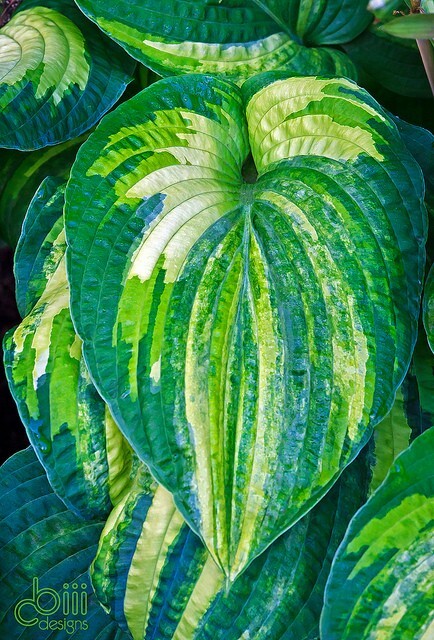 Categories: Musings | Tags: garden beds, hostas, oakleaf hydrangea, perennials | Permalink.